An easy recipe for Slow Cooker Ham and Bean Soup. Always buy a bone-in ham so you can make this soup! You don’t need to soak the beans ahead, either. It’s easy, delicious, and made right in your crockpot. 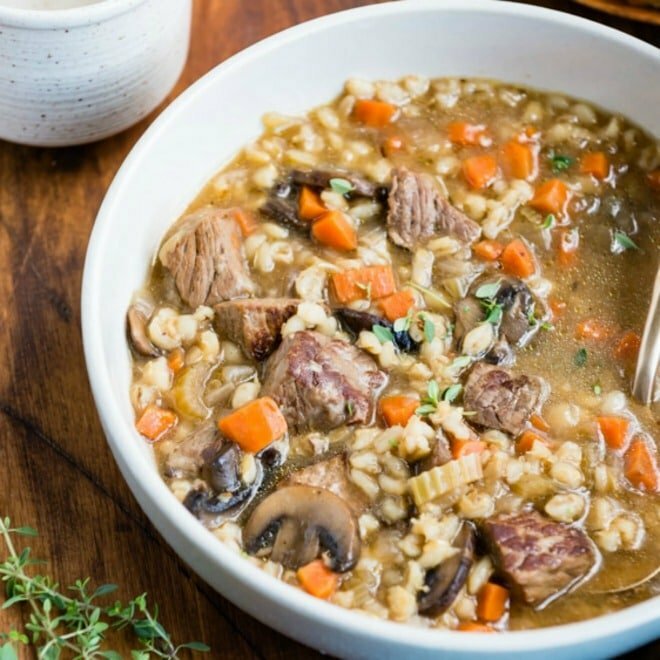 There are many reasons to buy fully-cooked bone-in hams, and the prospect of a delicious Ham and Bean Soup the next day is certainly a compelling one. Put the ham bone, and any leftover ham, to work in this easy, delicious soup. 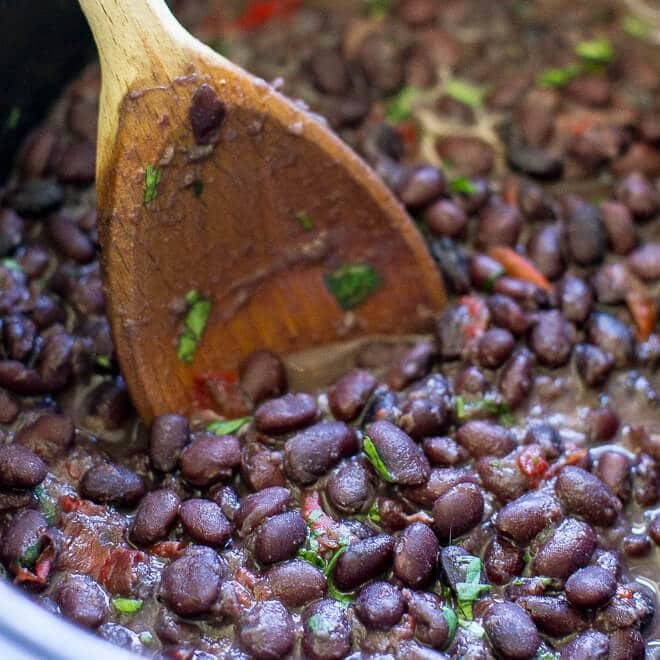 And you don’t have to soak the beans overnight before you make it! Saute the vegetables up front for the best flavor, then add the beans and broth. Bring everything to a boil before adding to your crockpot to kickstart the cooking process. Since ham is very salty on its own, I recommend using low-sodium chicken broth in Step 2. Do not add more salt until you’ve added the chopped ham from the bone (and any other leftover ham you have on hand). At that point, give it a taste and see if you think it needs more salt. As for the ham bone, it goes without saying that a meatier ham bone will produce a meatier soup. Do you have to soak beans before cooking them? It is not necessary to soak beans before you cook them. Depending on the type of bean in question, it will take 10 to 30 minutes longer to cook beans that haven’t been soaked ahead. Can you cook beans in soaking water? If you decide to soak your beans (to save that 10 minutes on the cooking time), you don’t need to throw away the soaking water. Add that to the crockpot as part of the 4 cups in the recipe. Can you freeze Homemade Ham and Bean soup? To freeze ham and bean soup, place it in a shallow dish in the refrigerator to chill. Then, transfer to a freezer-safe container and freeze up to 2 months. 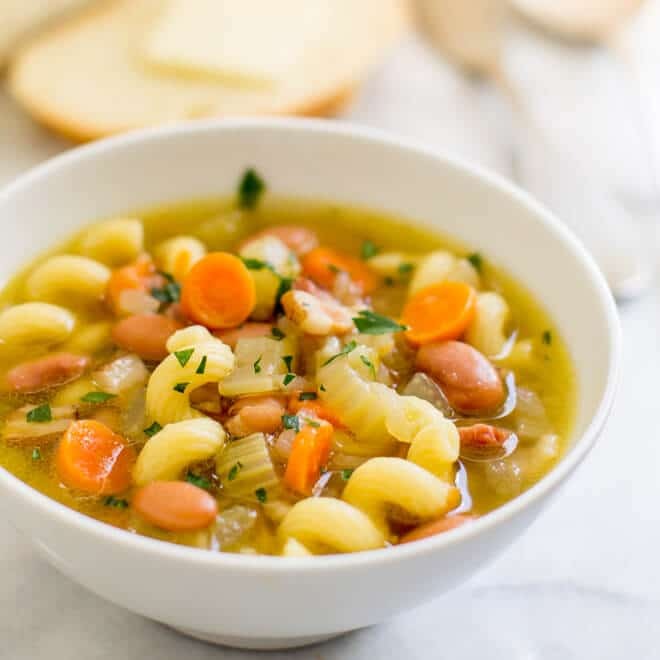 Save this Slow Cooker Ham and Bean Soup to your “Slow Cooker” Pinterest board! An easy recipe for Slow Cooker Ham and Bean Soup. Always buy a bone-in ham so you can make this soup! 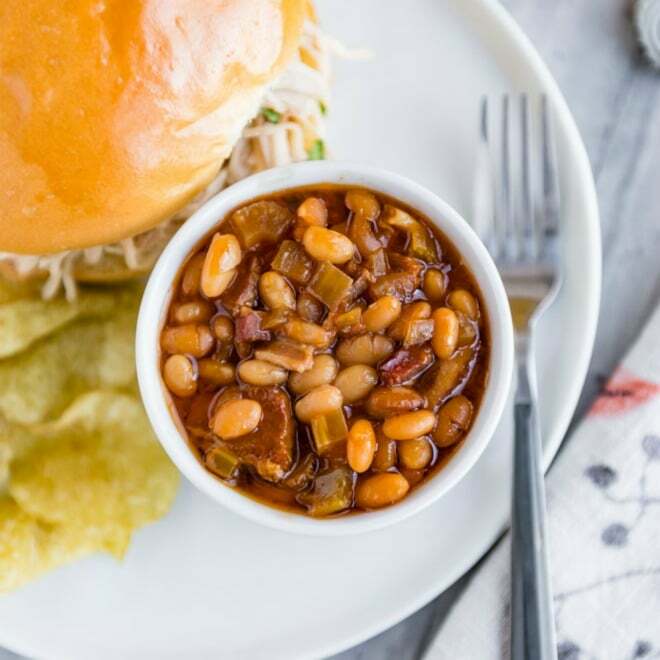 You don't need to soak the beans ahead, either. It's easy, delicious, and made right in your crockpot. In a 3-quart saucepan or Dutch oven, heat olive oil over medium-high heat until shimmering. Sauté carrots, celery, and onion until softened and translucent, about 8 to 10 minutes. Stir in broth, water, beans, ham bone,, garlic powder, cumin, parprika, thyme, and bay leaf. Bring to a boil. Pour into slow cooker. Heat on HIGH for 4 to 6 hours or until beans are tender. Remove ham bone and bay leaf. Chop ham from bone and return to slow cooker. Add additional leftover ham, if using, and cover until heated through, about 5 minutes. Season to taste with salt and pepper. I love making soup with ham. I usually make it with split peas, but I love the use of pinto or navy beans making it so hearty. l love meaty ham bones! 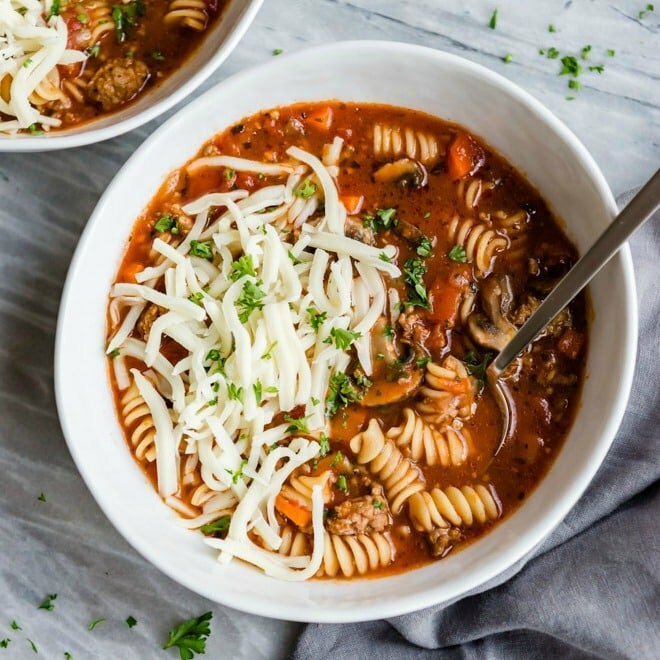 My mom makes a very similar soup to this with green lentils instead. Yes, green lentils (or split peas) are so tasty in this soup! This looks wonderful! Ham bone soup is one of my favorites, especially on cold days. Love the classic flavors you’ve used! Just go with it! Use your ham and the recipe as-is. Bones provide a more gelatinous texture and a richer flavor, but you’ll be fine without. I wouldn’t change anything. Just roll with it! Feel free to report back and let me know how it goes! Good luck! Thanks for quick reply….am gonna ‘go with it’. Let you know. Never had with the veggies—mom just used bone, water, and beans. Ham and bean soup without bone came out GREAT! Used only ham, navy beans, chic broth a and basil. son ate 2 bowls and took some home “go with it” is great advice!!!! This is so great!!! Obviously you are a talented cook and you get all the credit. I will add some notes to the recipe so everyone else can benefit from your wisdom. So glad it worked out, you made my day! Take care. Very good taste like moms use too. This is such a wonderful soup. I have been making it for years. The only thing I do different is….. I soak the beans in the crock over night, then throw everything in it. No sauting, or anything. Everything right into the crock. I do add a smoked ham hock to it too, which gives it a very nice subtle smoky flavor. Sever with some homemade dinner rolls, and everybody is happy! It is the only way I can get my boys to eat ham and bean soup! Making this right now I used a chicken broth, that had garlic, in it and it smells amazing. I used about 9slices of smoked ham, will leave the salt out until closer to dinner, I used canned beans, and carrots, did use fresh onions, and everything else was dry herb. I will make home made rolls. This soup is delicious!! I added around 8 pieces of bacon towards the end of the cook time and it added great flavor. My boyfriend told me it was his favorite meal I’ve ever made haha. This recipe is definitely a keeper! Thank you for sharing !! I want to make this soup but the only dried beans that I have are baby Lima beans. Would that work for this! I have left over ham & ham bone. I usually make Split Pea soup but this was amazing. It was fresh and hearty and great on a cold winter’s night.